Control Valve Performer app by simulationHub is specially created for design engineers. 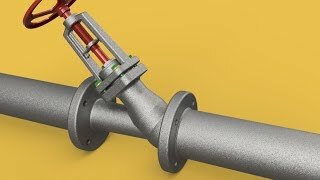 This app is built taking into consideration that all valve designers may not have any knowledge about complex CFD processes. The app asks only the inputs and details which the designer can give easily. Inputs related to CFD including flow conditions, meshing and solver details all are automatically computed by algorithm. The CFD process is automated with special customized solution settings for control valve flow simulations. The results are presented in simple and ready to use characteristic curve plots. And this is all needed to get a characteristic curve of control valve using this app. The app then takes all the inputs and does a number of CFD simulations to predict the characteristic value at each opening. The computations are done using simulationHub’s cloud computing resources and do not use any local computer. Once the simulation is completed successfully, the user can download an auto-generated CFD report with all the results and findings. The subscription of 'Control Valve Performer' app is based on a simulation credits system. After you download the 'Control Valve Performer' app from the Autodesk app store for free, you can select a subscription plan for the app from SimulationHub AppStore. As Control Valve Performer app performs CFD simulation to provide valve performance, computational resources are engaged on servers to run the simulations. The subscription plan covers the cost involved in utilizing these computational resources. There are three subscription plans: Trial subscription (free); Monthly subscription (USD 500); Yearly subscription (USD 5000). 2. Monthly subscription plan - USD 500 (meant for light use): In this subscription plan you will receive 100 simulation credits with 30 days of validity. Each valve opening configuration (angle/displacement) would consume one simulation credit when it is submitted for simulation. One simulation is required for each angle. A performance curve consists of simulations for multiple valve openings. For example, 8 credits would be consumed to generate the valve performance curve with 8 valve openings. In case if you are running out of simulation credits within the subscription period, you can buy additional top-up credits as and when needed. 3. Yearly subscription plan - USD 5000 (meant for heavy use): In this subscription plan you will receive 1200 simulation credits with 365 days of validity. Each valve opening configuration (angle/displacement) would consume one simulation credit when it is submitted for simulation. One simulation is required for each angle. A performance curve consists of simulations for multiple valve openings. For example, 8 credits would be consumed to generate the valve performance curve with 8 valve openings. Your subscription will end after the duration of one year or after performing a total of 1200 simulations whichever comes earlier. In case if you are running out of simulation credits within the subscription period, you can buy additional top-up credits as and when needed.